It is FINALLY Raining Again! I think we broke a record for the most days without rain. 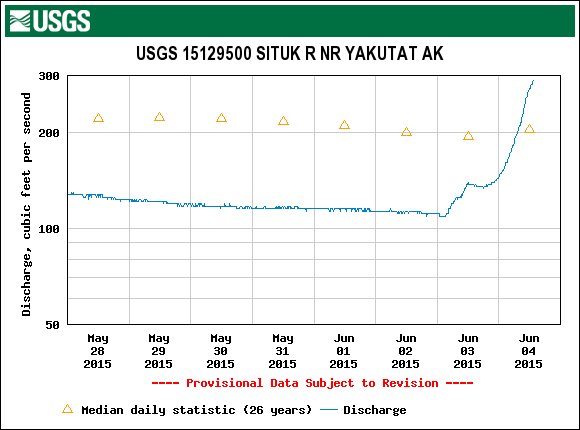 In Yakutat, that probably means 2, since it usually seems like it rains constantly, but… It is storming like crazy out there, with 40 knot winds. The water flow has come up above “normal” for the first time in a month. This’ll flush the rest of the steelhead out of the river quickly. The run was basically over anyway, with just under 7,000 kelts counted so far. That makes for an “average” sized run. 6,868 total as of a couple days ago and we’ll squeak over that 7-grand total before it is over. There are pockets of sockeye in the lower river now, as well as a few kings. They actually counted two large kings through the weir already! Woo, hoo! Chris and a friend went fishing below the weir night before last and landed a half dozen sockeye (hooking twice that fairly) in just a couple hours. It is still very early, but they are starting to cluster in large enough numbers to actually fish. We’re in the long slow stretch between steelhead and salmon. Just biding our time and getting a little construction done on the hangar during the break. If you come through, the door may be locked at the shop while we are in the hangar (or in my office watching a movie…). As always, just honk on the horn and we’ll be right there! 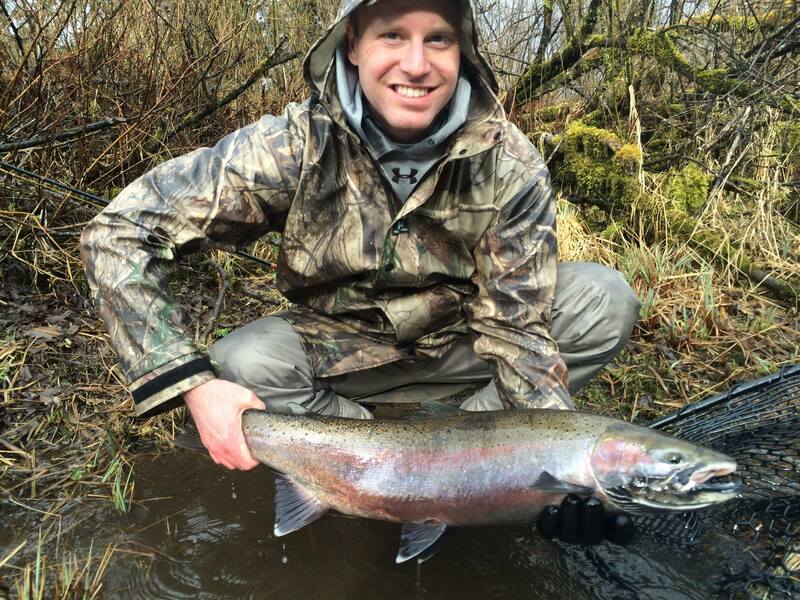 This entry was posted in Alaska, Fishing, Flyfishing, Salmon, Situk River, Steelhead, Yakutat and tagged akwe kings, east river kings, situk, situk fishing report, situk report, Situk River, situk river report, situk river steelhead, situk sockeye, Situk Steelhead, situk steelhead report, Yakutat, yakutat alaska. Bookmark the permalink. Would Chris consider doing a “how to” catch sockeyes short video? Alaska Fish and Wildlife has one (June) but it is just “flossing” with fairly large hooks and yarn. Fished for them in the Situk for several years and still can’t figure out how to legally hook more than about 1 in 10. Open daily in Yakutat’s ol’ WWII hangar at the Yakutat Airport. Attention all Hangar Storage customers... This 2017/18 winter season will be the end of public hangar storage. All gear, boats and vehicles must be out after this season. Start making other arrangements now because there are no exceptions. March 29th, 2019 - Overcast, 42 degree water, flow at 238CFS. IDEAL conditions. Lake is open and dumping winter fish into the system, more and more spring fish are coming in daily. Buy AK Fishing License Online!